Among the great rarities in the hobby, depicting one of th games' all time most beloved figures. 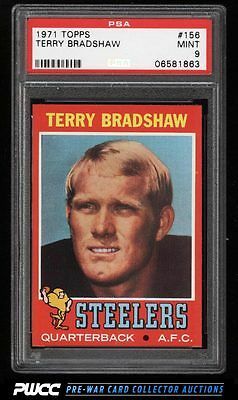 Rarely is the '71 Bradshaw seen in grades higher than NM-MT. The offered MINT example stands among the hobby's elite specimen, boasting flawless surfaces, chipless edges, and four immaculate corners. Dead centered and stunning throughout; fully worthy of the lofty PSA grade. One of nearly 17,000 cards, lots, and sets up for bid in our 8th Auction of 2016. Click on the link above to view the other PWCC auction lots.